What is the stress in the satellite tether? Here is a brain teaser to find it out! What is the stress in the tether? With a couple of simple assumptions and single back of the envelope calculation, Greg calculated about what the stress in carbon nanotubes would experience. Can you? Note his answer is about 500 times what high tensile steels can endure. Since we’re rigorous engineers, we’ll calculate it accurately sometime before the next newsletter. But can get closer to the accurate answer than Greg did using three constants and one simple equation? We wonder how difficult it will be to attach an elevator to a significantly varying cross section! Per the conceptual image of a tethered satellite, what is the stress in the tether? Assume the counterweight just balances the weight of a constant cross section carbon nanotube tether. 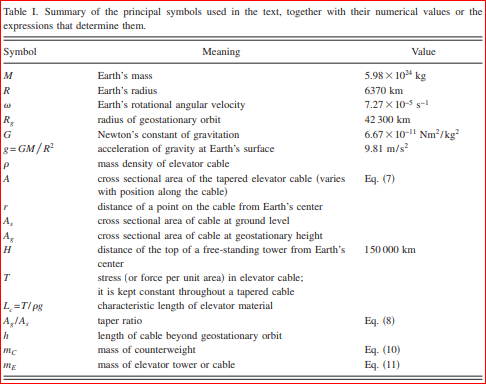 The density of carbon nanotubes is 1300 kg/m^3 and the distance to Geostationary Orbit is 42,300 km per the table below. Assume earth surface gravity, i.e. neglect the variation with altitude initially. ⟵Canterbury TechSummit 2018- It’s a wrap!